Cassini Looks at Titan - Universe Galaxies And Stars Section. Cassini Gets Another Look at Titan. Moon Titan: Image credit: NASA/JPL/Space Science. NASA's Cassini spacecraft turned its gaze on Saturn's mysterious Moon Titan again, taking another early look at its haze-obscured surface. The spacecraft was 29.3 million kilometres (18.2 million miles) when it took this picture with its narrow angle camera. Cassini's pictures of Titan are now better than anything that can be taken with Earth-based telescopes. scientists will get an even better view of Titan when the spacecraft reaches Saturn and its moons in July 2004. Cassini continues its ground-breaking observations of Saturn's mysterious Moon Titan, stealing another early peek at its haze-enshrouded surface. The spacecraft was 29.3 million kilometers (18.2 million miles) from Titan on May 5, 2004 when the image on the left was taken through one of the narrow angle camera's spectral filters (centered at 938 nanometers) specifically designed to penetrate the moon's thick atmosphere. The image scale is 176 kilometers (109 miles) per pixel, an improvement in resolution of 30% over the images released on May 6. Cassini's view of Titan now surpasses Earth-based observations in its ability to show detail. The image has been magnified 10 times using a procedure which smoothly interpolates between pixels to create intermediate pixel values, and has been enhanced in contrast to bring out details. The mottled pattern is an artifact of the processing. The larger scale brightness variations are real. No further processing to remove the effects of the overlying atmosphere has been performed. The superimposed coordinate system grid in the accompanying image on the right illustrates the geographical regions of the Moon that are illuminated and visible, as well as the orientation of Titan - north is up and rotated 25 degrees to the left. The yellow curve marks the position of the boundary between day and night on Titan. This image shows about one quarter of Titan's surface, from 180 to 250 degrees West longitude, and overlaps part of the surface shown in the previous Cassini image release (PIA 05390). 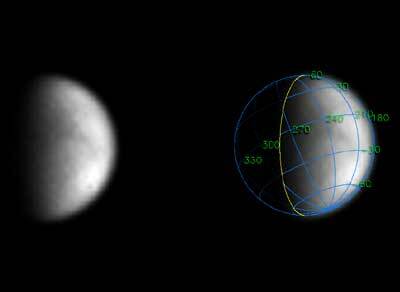 (That release also included a map of relative surface brightness variations on Titan as measured from images taken with the Hubble Space Telescope.) The dark northwest-southeast trending southern hemisphere feature extending from 210 degrees to 250 degrees West longitude, and the bright region to the east (right) and southeast of it at -50 degrees latitude and 180 to 230 degrees West longitude on the Hubble map, are visible again in today's release.